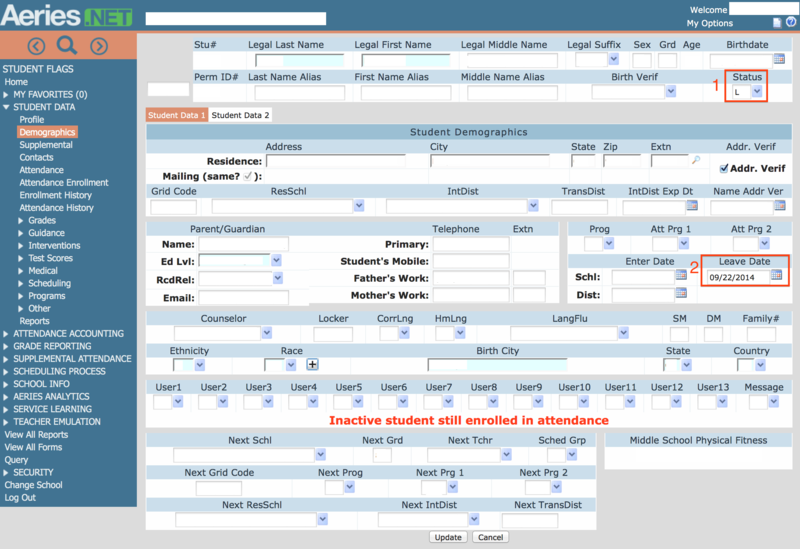 Step 1: Open the student record and navigate to "Student Data > Demographics". Step 3: Input your LEAVE DATE and EXIT REASON before pressing "OK". Step 4: You will be prompted with the warning that: "Student has attendance after this date. Is it OK to Delete?" Click Yes. 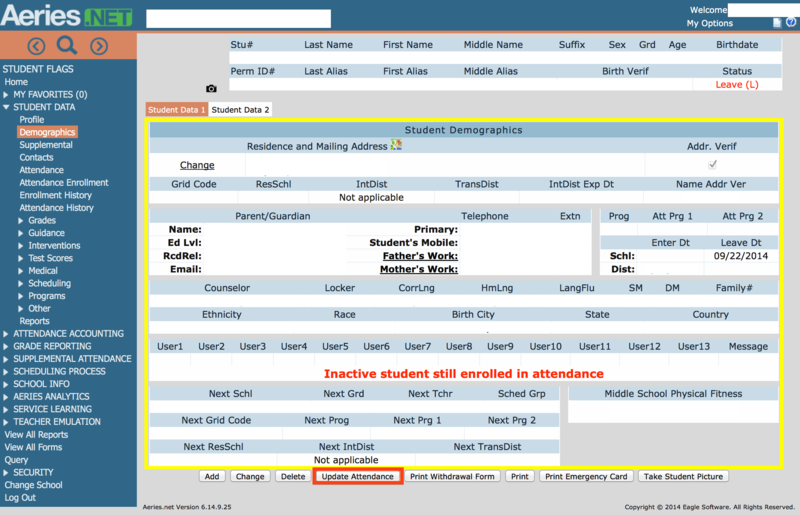 4: You are successful now that there is no warning on the student demographic screen and the yellow box indicates that the student is not active! When a school has made the determination that a student needs to be dropped from the school, there are two primary things that we need to know in order to exit them from Aeries CS properly. 1) What was the last day that the student attended the school? This is your LEAVE DATE. 2) What was the reason that the student is being exited from the school? This is your EXIT REASON. Once you have confirmed the above information with your staff and have acquired all of the documentation necessary, you can follow these steps to perform the exit from Aeries.NET. 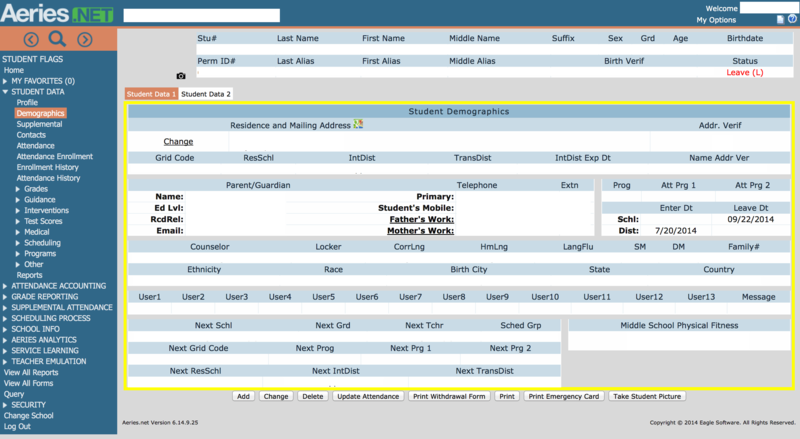 Step 1: Open the student record and navigate to “Student Data > Demographics”. Step 3: Input your LEAVE DATE and EXIT REASON before pressing “OK”. Exit Codes are very important as they are used by the state to determine whether students have enrollment conflicts at other schools, truancy issues and even drop outs. Below is a list of the different exit codes and their descriptions from the CALPADS Code Set. In Aeries, the first letter is usually dropped. Step 4: You will be prompted with the warning that: “Student has attendance after this date. Is it OK to Delete?” Click Yes.